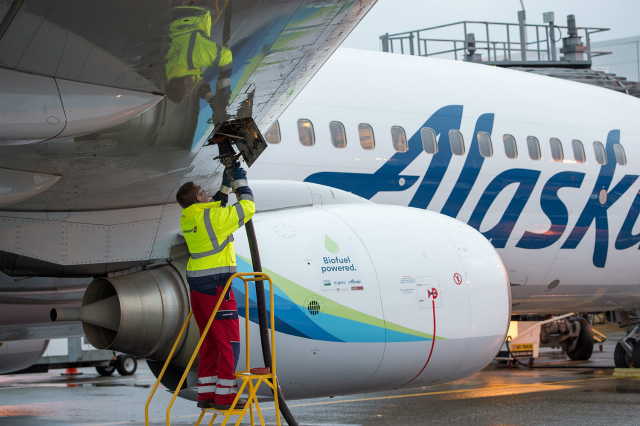 Seattle, WA...Washington state-based Alaska Airlines made history yesterday flying the first commercial flight using the world's first renewable, alternative jet fuel made from forest residuals, the limbs and branches that remain after the harvesting of managed forests. The alternative jet fuel was produced through the efforts of the Washington State University-led Northwest Advanced Renewables Alliance (NARA). The demonstration flight departed Seattle-Tacoma International Airport yesterday morning for Reagan National Airport in Washington, D.C. The flight was fueled with a 20 percent blend of sustainable aviation biofuel, which is chemically indistinguishable from regular jet A fuel. The flight, the first commercial passenger flight of its kind, continues to advance viable alternatives to conventional fossil fuels for aviation. Big woop! You letme know when they make a Cummings turba disel jet and I may be impressed. Yes sir spelling otter! They got rid of the "g" because those silent letters confuse the hell out of the rednecks! Hey, it is the liberal with no job making fun of a stereotype again! So tolerant, so educated, so compassionate! What a loser! Your lady still finds me like granite. Another alternative fuel for (not my) President Trump to eliminate so he can keep his oily pals happy. While you're busy being nobodies President, I'll eat your pets.